1 Let’s begin by getting our pot nice and hot over medium heat. Pour some oil and sauté the garlic and onion. 2 Add the chicken breast next and sauté until cooked through. 3 Pour the atsuete oil followed by the water. To make atsuete oil, bring to a boil 1 tbsp of atsuete and 2 tbsp of oil. Drain the atsuete and reserve the oil. 4 Drop in the Knorr Chicken Broth Cubes and sotanghon noodles. Stir well and let it simmer. 5 Now that our soup is done, serve in a bowl with a sprinkle of spring onions and crunchy fried garlic on top. 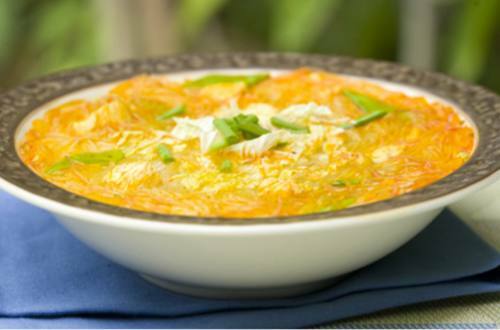 Chicken Sotanghon soup is one of those dishes you will not get tired of eating or cooking. It’s just close to home.